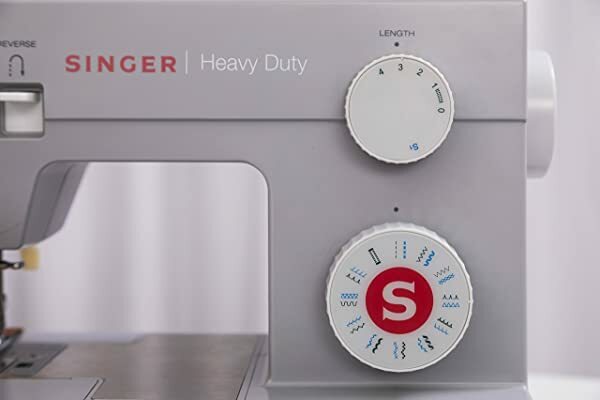 Singer, a well-renowned company, has manufactured numerous exceptional sewing machines. 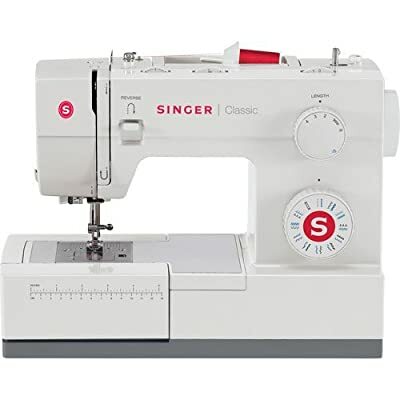 As anyone who has hit the market in search of a suitable sewing machine, you will agree. Two machines that have gained commendable popularity are the 44S and the 4423. Of course, the only question is, which one is the better pick? Let’s find out with our comparison of the two! 2.1 Can Both Handle Stitching Heavy Fabrics? 2.3 Are Both Ideal For Professional Use? Before we get into all the details, let’s have a brief overview. Of course, like all Singer machines, these two models are also great, and both have more or less the same features. The differences lie in the color, the measurement markings, and the speed. 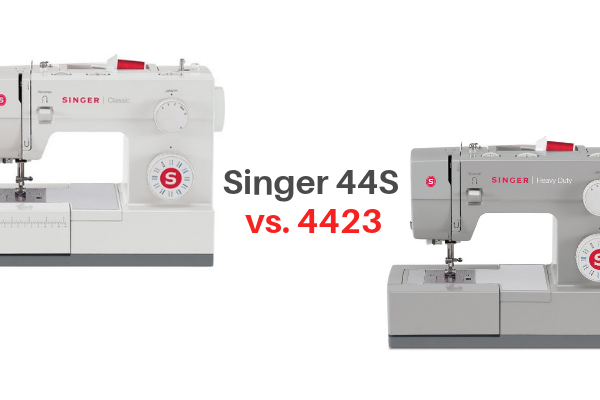 In addition, the Singer 4423 has been a top-selling machine while the 44S wasn’t able to gain the same popularity. 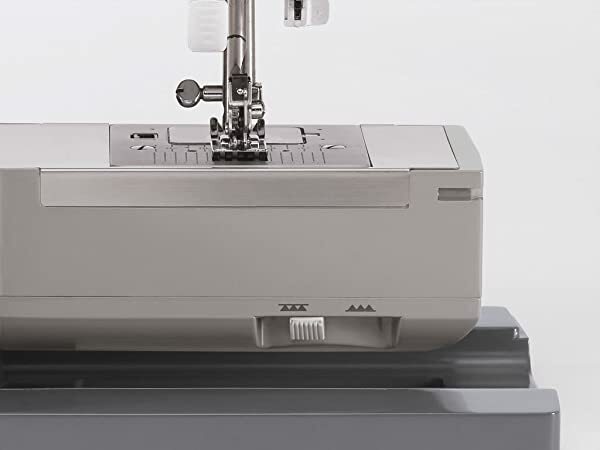 Regardless, both the 44S and the 4423 are excellent mechanical sewing machines that can easily handle your needs. Now, look into the functionalities and features of the two in depth. You’ll really be astounded by how much the two models look identical. Apart from the measurements, you’ll find on the 44s; the two are identical. Thus, it hardly comes as a surprise that both models have 23 built-in stitches. Both new and casual users won’t really need numerous stitches. In fact, even these 23 might be too many for a few sewers. Regardless, it’s always nice to have a good selection available. Overall, with both the 4423 and the 44S, choosing the stitch and then using it is easy. Both the models come with the common and essential stitches. These include buttonhole stitch, stretch stitch, and decorative stitch. With these stitches, you can start with your sewing projects right away! 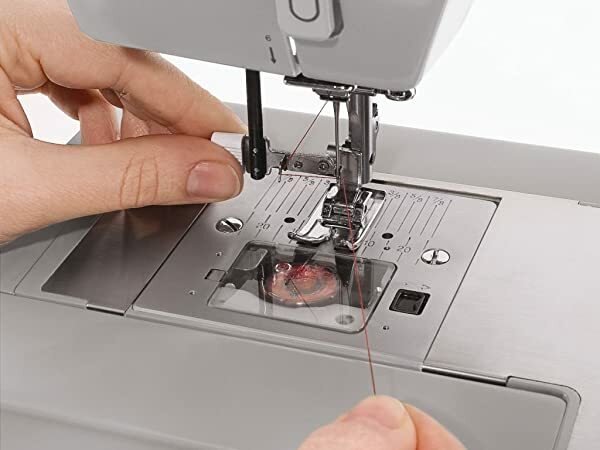 When it comes to the stitching speed, the 4423 is the winner since it can sew at 1100 stitches per minute. Meanwhile, the maximum speed for the 44s is 1000 stitches per minute. While the minor difference in speed might not faze beginners, experts might want to have more speed. The 100 SPM difference is, in fact, why 4423 was a best-seller compared to the mediocre selling performance of the 44S. Now that we’ve seen the basic features, let’s talk in terms of capabilities. Can Both Handle Stitching Heavy Fabrics? Both the models can handle everything ranging from light to heavy fabrics. 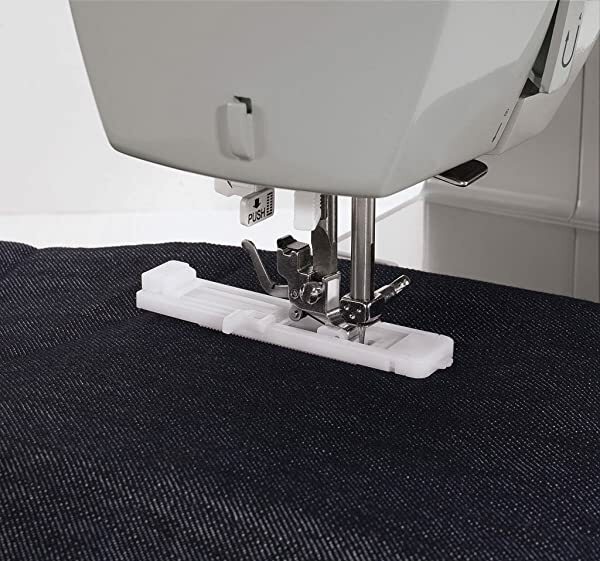 So, you can work on denim as well as multi-layered fabrics with both the machines. The stitches for both models pass through the materials easily. At the same time, they don’t wear out as other machines do. In addition, both the models come with a bedplate that allows consistent fabric feeding. Plus, since the machines are made of stainless steel, they also last longer. Of course, since the two machines are so similar, the debate of which one is easier to use comes quite close. Both of the models come with auto needle threaders. Similarly, both the models have a top drop-in bobbin with a clear cover which makes it easy to use. Plus, the bobbin on both the models winds up quite nicely. Simultaneously, the rest of the unit works with the other features to ensure smooth stitching. Are Both Ideal For Professional Use? This is one commonly asked question when it comes to choosing between the 44s and the 4423. 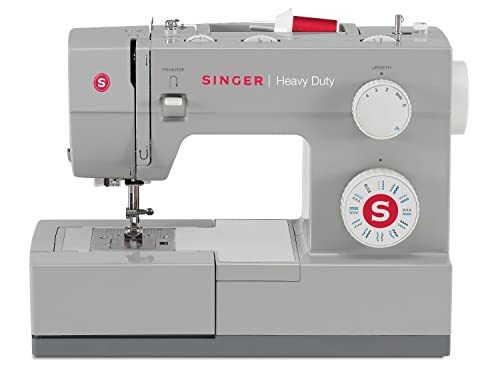 While both are excellent home sewing machines, they can be easily used for professional purposes. However, that also depends on your requirements. If you want speed, then the 4423 is the better choice. You should, however, note that both of these can’t handle sewing canvas and heavy leather. So, if your work revolves mostly around heavy materials, neither one of them would be the best bet. Meanwhile, the versatility of both the machines allows you to use it for heavy jeans as well as baby diapers. You can also hem pants easily. Both the models are essentially mechanical heavy duty machines that can handle various tasks. Despite that, they are relatively quiet. Of course, they’re not whisper-quiet, but they’re not as audible as old mechanical machines are. Both models can handle pretty much whatever you throw at it. Working with a soft cloth won’t be any problem at all. And like mentioned earlier, it can work through multi-layer fabrics like denim easily. 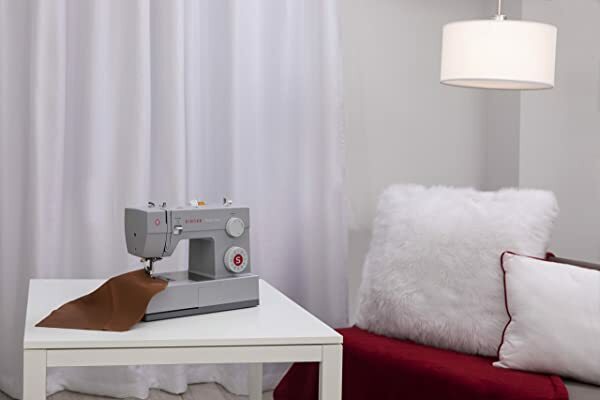 While both the machines are used for clothes, you can also use them for other items like quilts, home decors, and handbags. When comparing both the models, it is clear that both provide consistent performance. Both feature an excellent bobbin winder, and the free arm is well-made too. With both the machines, you have to set the stitches using the dials. The dials also provide you complete control. Adding to the machines’ functionality, both the models backstitch well even if you use several layers. While both the machines promise impressive performance, the nearly identical design doesn’t guarantee the same performance. 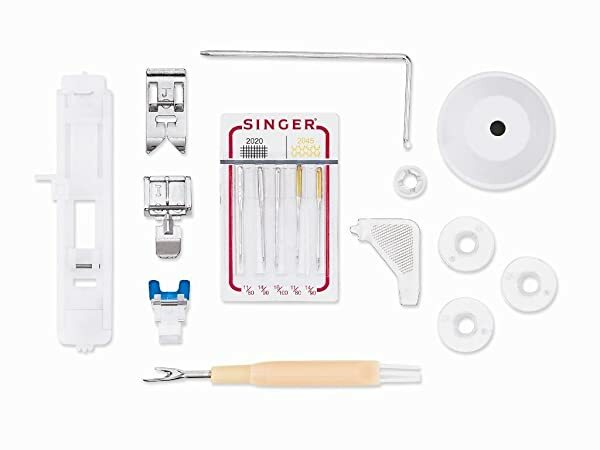 Thus, the Singer 4423 can do everyday stitches much better. However, the difference isn’t much, and as a beginner, you wouldn’t even notice it. Given the identical frames, both are the same in terms of stability. Both the machines have heavy-duty internal frames. They won’t wobble even if you are working with heavy fabrics. 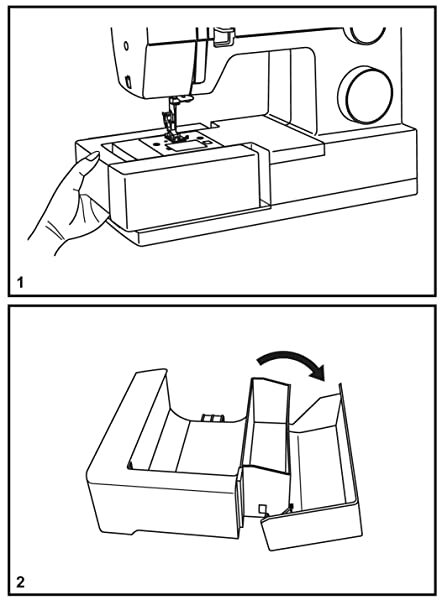 So, you can easily sew multiple layers of flannel and cotton, and the machine won’t rattle. Overall, both the machines are workhorses considering their construction. To sum it up, the two have numerous common features and specs. For instance, they have the same needle threader, top drop-in bobbin, and dial stitch selection. Similarly, the needle positions, drop feed, and free arm are also the same. In fact, the number of stitches is the same as well. While both the machines are competent, they still lack in some areas. For instance, there is no speed controller or a start/stop button. Similarly, there is no monogramming font or a programmable needle. It is pretty clear; the only major difference is the speed and the measurement markings. Yes, there are markings on the 44S, but that isn’t a deal breaker. You can easily get an external tool for measurement at a meager cost. There’s also an aesthetic difference. While the 44S is white, the 4423 is gray. However, you can’t get the extra 100 SPM if you choose to go with the Singer 4423. So, choose wisely! 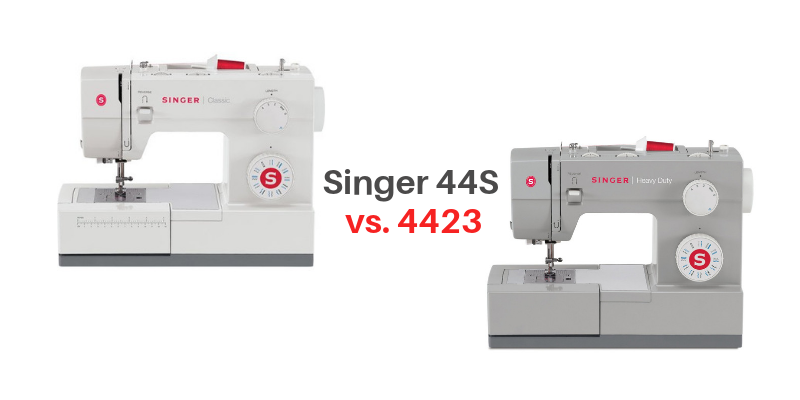 Previous Previous post: Singer 4423 vs 4432 – Which one is better?